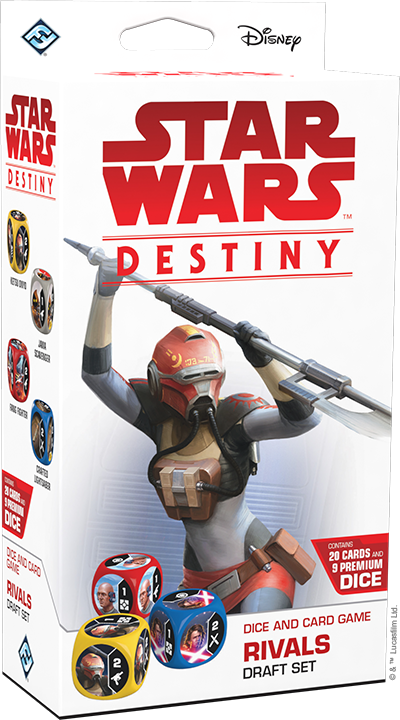 With the release of the Rivals Draft Set last year, Star Wars™: Destiny players discovered a whole new way to play. With Rivals and six booster packs, any player can can construct a deck from a limited pool of cards and test their skills against other participants in a draft or sealed event. 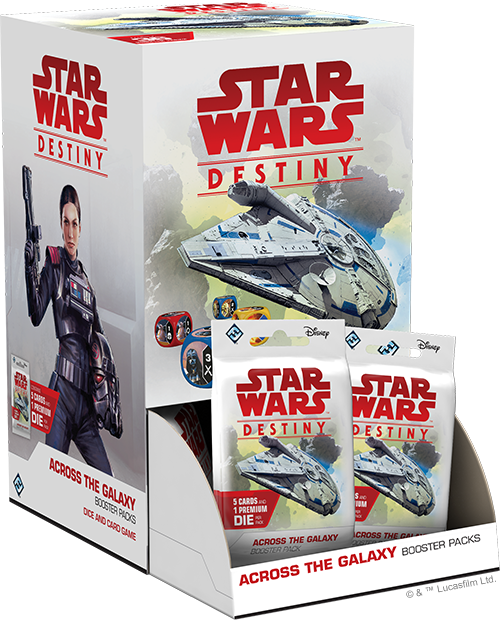 Of course, every new set of Star Wars: Destiny can drastically change draft strategies. 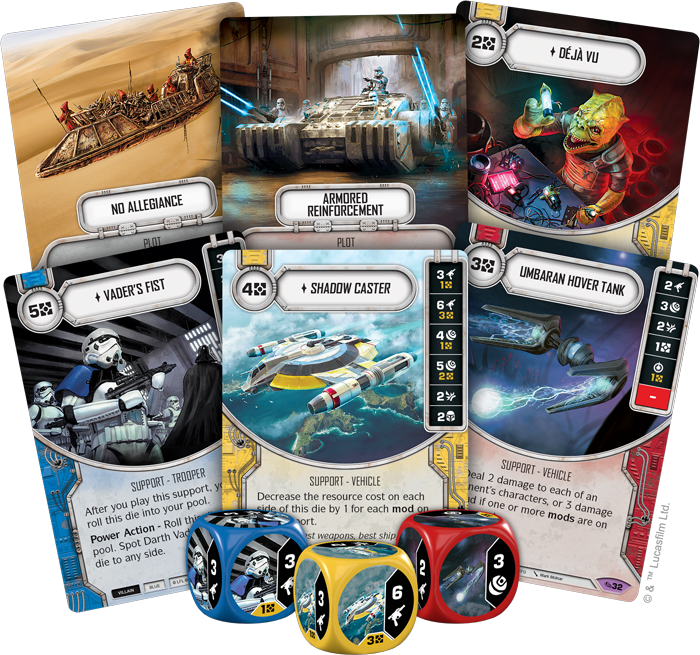 Join us today as Zach Bunn of Team Covenant discusses some of the strategies for drafting with Across the Galaxy! 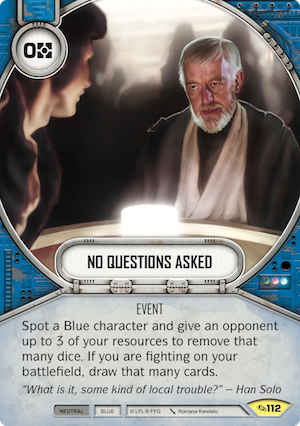 As much as I love building Star Wars: Destiny decks, nothing compares to experiencing cards for the first time in a draft after a new set is released! If you have just never drafted Star Wars: Destiny or are new to the game, I cannot recommend drafting enough. Draft is extremely fun way to play Star Wars: Destiny and since you only need to own the Rivals Draft Set to play, it's the most accessible format in the game. It is also one of the best ways to build a collection! Draft a Red or Blue character that costs nine points or less OR draft a Yellow character that cost ten points or less. Draft non-character cards that have dice. Draft cards that manipulate your dice and your opponent’s dice. Draft cards that gain resources. Draft cards you want to add to your collection. 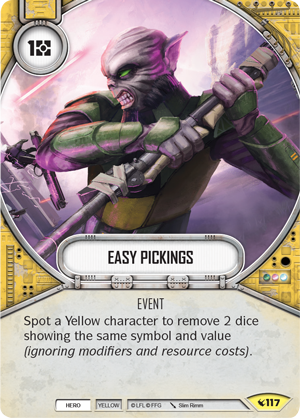 In this article, we'll look specifically at drafting Across the Galaxy, the latest set of Star Wars: Destiny. If you're looking for a more comprehensive introduction to drafting, you can start here first: Everything You Need To Know About Drafting. 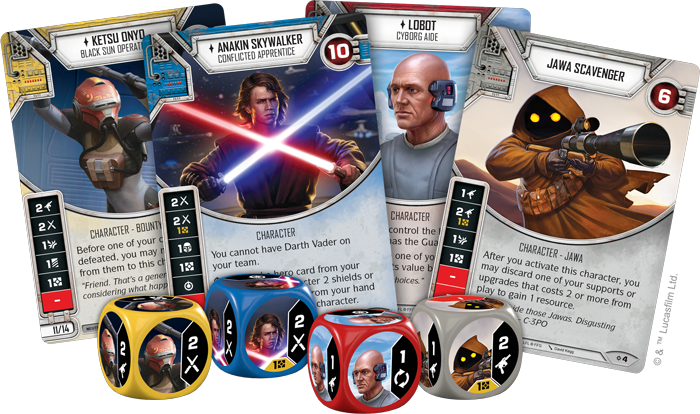 In Rivals, you'll get Anakin Skywalker (Rivals, 1), Lobot (Rivals, 2), Ketsu Onyo (Rivals, 3) and a Jawa Scavenger (Rivals, 4). 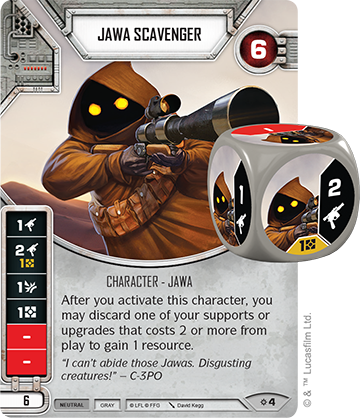 Before Across the Galaxy, if you didn’t draft a character in your packs it meant you were playing with the Jawa Scavenger on your team and only going to use two colors for deck building. With Across the Galaxy came the introduction of negative plots, which is shaking up both the draft and constructed formats. 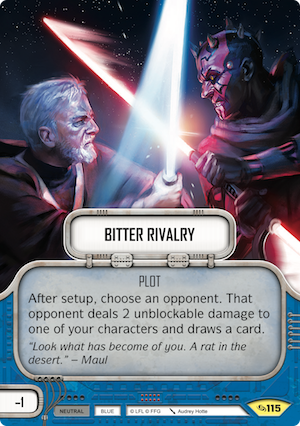 Perhaps the most important cards from Across the Galaxy for draft are the negative-point plots, No Allegiance (Across the Galaxy, 155) and Bitter Rivalry (Across the Galaxy, 115). 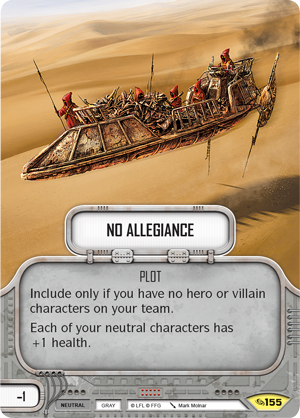 Both plots allow you to play Anakin, Lobot, and Ketsu from Rivals without drafting any additional characters! This makes almost every card in the draft starter playable and with every stack of cards passed your way you can take the best card, rather than being limited by the colors you're locked into. This increases the average quality of the cards in your deck for starters, and it never leaves you in a bind if you are passed a stack of cards of a single color. Following the guidelines previously listed for new players is easy, but draft is all about making choices. Making the right choice is a lot trickier than just following the list of guidelines! For example, what do you do if these are the three die cards in your first set of packs? Based on the guidelines, Bariss Offee (Across the Galaxy, 55) is the card you pick… right? Any "damage to all of your opponent’s characters" abilities (I refer to these as AOE abilities) always ranks high on my priority list, especially in draft. Most decks play three characters in draft and very few have a way to do damage to all characters at once. 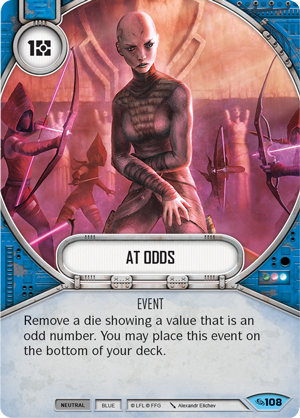 This puts Leia (Across the Galaxy, 90) on a very short list of high value cards that have AOE abilities, including Fear and Dead Men (Across the Galaxy, 7) and the Umbaran Hover Tank (Across the Galaxy, 32). 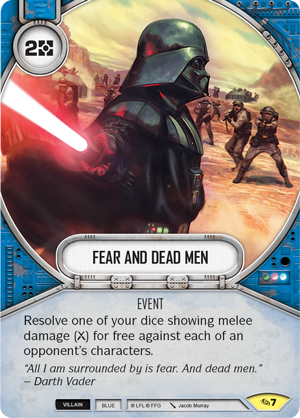 Even if no one blames you for taking Vader (Across the Galaxy, 1), drafting Vader or Leia creates an issue due to their high point cost. 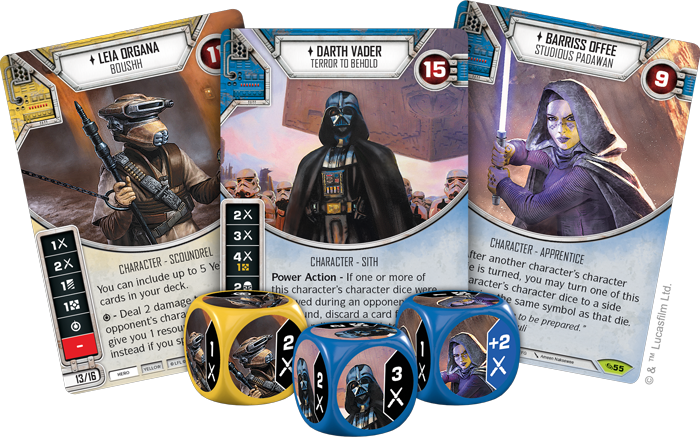 Since Darth Vader costs eighteen points, you only get to play one other character if you draft him. With Leia at thirteen, it means you will end up playing with a Jawa unless you draft two eight-point characters. A more subtle draft strategy I use is to only draft two colors unless I am 100 percent sure I can play the third. When drafting Legacies and Way of the Force, I wouldn’t draft any Red cards early on because I preferred playing Anakin and Ketsu. 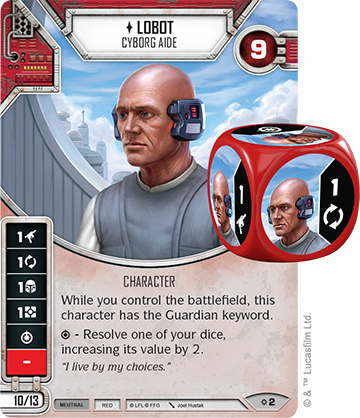 One focus of Across the Galaxy are vehicle modifications and since you need a vehicle to play mods, I lean toward playing Lobot more often to get access to the Fang Fighter (Rivals, 8). As much as I love Darth Vader, he is actually the lowest on my list for drafting among these three characters. I’m sure I’d draft him anyways and try to make it work, but Bariss and Leia are better draft choices almost every time if you want to actually win the draft. I would be tempted to grab Leia given how good her special is. At the end of the day though, I actually do think Bariss is the "right" choice most of the time. Picking Bariss is going to make your draft and subsequent deck building process a whole lot easier. This will make the average value of every card in your deck higher and will result in a much more consistently good deck. This isn't to say that Leia or Darth Vader are necessarily the wrong choice, as I have seen both work in actual draft play. It just means you are going to need a bit of good luck when you open your second set of packs. If you stick to two colors before drafting a big character, a good time to pick up Vader or Leia is with the second set of packs. 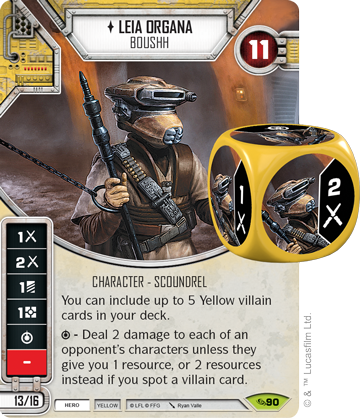 If you already have a lot of good Blue and Yellow cards for example, playing Vader and Ketsu or Leia, Anakin, and Jawa is a lot less risky. Assuming you picked Bariss though, what would you pick if you open these cards in your second set of packs? 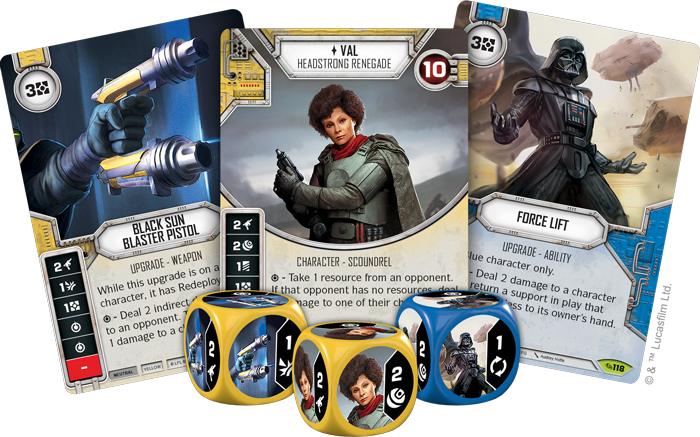 Val (Across the Galaxy, 37) is one of the best characters to draft from Across the Galaxy, so I would be tempted to pick her. 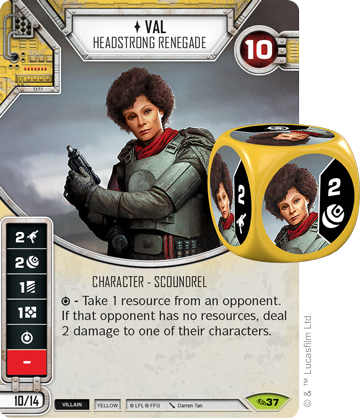 She has strong die sides and the ability to both gain resources and take them from your opponent puts her over the top. Since you already drafted Bariss though, is she really worth a draft pick? You could instead take one of the upgrades. 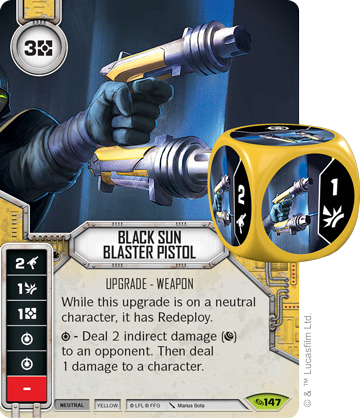 Before Across the Galaxy, I would have said the Black Sun Blaster Pistol (Across the Galaxy, 147) was the clear choice. Redeploy is uncommon in draft, so gaining access to a good upgrade with redeploy is a big deal. 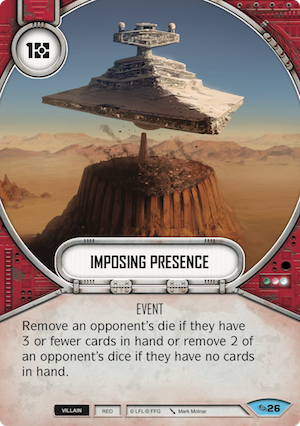 It is worth noting though, when Force Lift (Across the Galaxy, 118) puts a support back into your opponent’s hand, any mods attached get discarded. 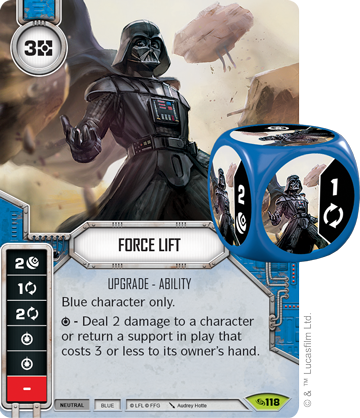 With modifications being a key theme of this set, Force Lift is a particularly special card in Across the Galaxy. If you draft Val, you can play Anakin instead of Bariss and gain access to one of the most powerful characters in the game. You also deny someone else having Val, which is important if you are likely to play against the people you are drafting with. If you don’t pick Val, you either add a redeploy upgrade to your deck or an upgrade that forms a direct answer to some of the most powerful cards in the set. I’m not certain there is a "right" answer to which card to pick. Once the characters and dice cards are drafted, you want to start looking for the best dice manipulation cards in each stack of cards. Unlike past sets, there are not high-powered control cards like Easy Pickings (Legacies, 117). 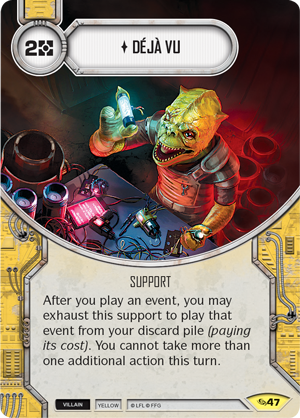 One of my favorite aspects of Across the Galaxy is how every card seems to come with a different restriction. This makes each card uniquely valuable and forces you to pick cards based on preference and the rest of the cards you've been drafting. 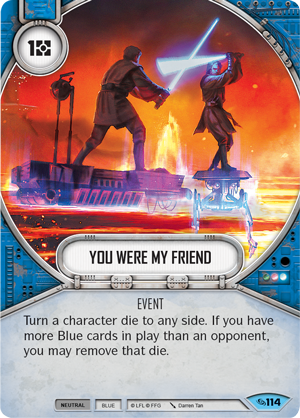 This can be understood by comparing two one-cost control cards, You Were My Friend (Across the Galaxy, 114) and At Odds (Across the Galaxy, 108). At Odds always removes a die, but can only ever remove a die with an odd value. It has the added value of going to the bottom of your deck though, and since mill is a viable strategy in draft, this can be important. On the other hand, You Were My Friend can always turn a die and will sometimes be able to remove it. So, which one is better? It really depends on your character team. One of the more subtle upsides of You Were My Friend is that you can also turn your own dice. 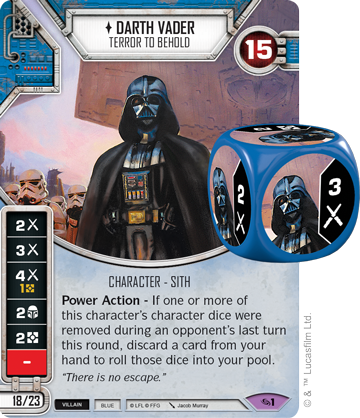 So, if you drafted Darth Vader or Leia in our earlier example, being able to turn to his four damage side or her special side is actually super valuable. 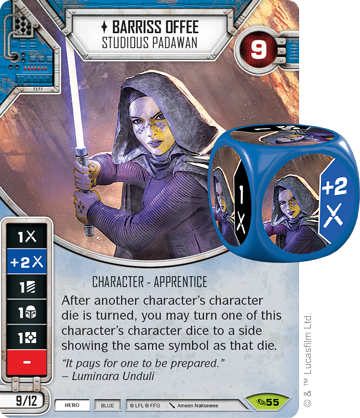 If your dice aren’t as game-shaping as Vader or Leia, At Odds is probably a more consistent choice. Another tricky part of draft is how differently cards play in constructed and draft. 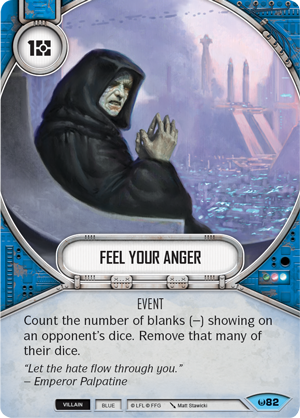 This is easily illustrated if we compare a new control card, Shriek (Across the Galaxy, 149), to a much older one, Feel Your Anger (Awakenings, 82). The latter is clearly a stronger card, since you can remove any of your opponents dice. Fortunately, Feel Your Anger is not in Across the Galaxy. It may be easy to dismiss Shriek, especially if you are used to cards like Feel Your Anger. 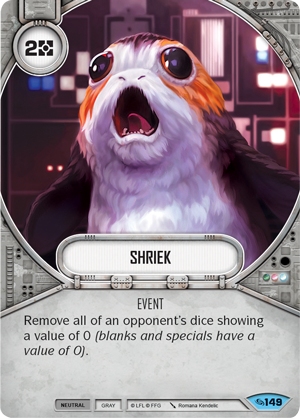 Shriek is a very strong card in draft though, as it has the potential to remove more dice than any other single card in Across the Galaxy. It is also gray, meaning it can be included in your deck regardless of how the rest of your draft goes or which team you decide to play when you’re actually building your deck. There are also plenty of control cards that are good in both constructed and draft, though. 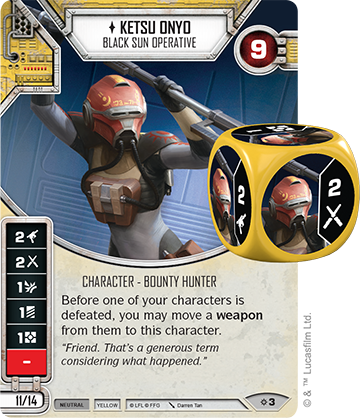 A great example of these kind of cards includes No Questions Asked (Across the Galaxy, 112) and Imposing Presence (Across the Galaxy, 26). Finally, there are a few cards worth pointing out specifically because they can (hyperbolically) win games on their own. The cards pictured above are so good, I can’t imagine drafting similar cards above them. These are also the kind of cards that if drawn, are feasibly worth taking inefficient or abnormal turns to ensure they enter play. 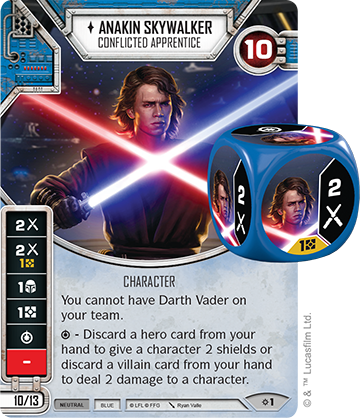 For example, let’s say you draw a Vader’s Fist (Across the Galaxy, 13) on your first turn. In draft, I would rarely recommend gaining and saving resources for your second turn or to hang onto a card for several turns. You usually want to play upgrades and build your board, or empty your hand of unplayable cards to make sure you can play as many cards as possible each turn. 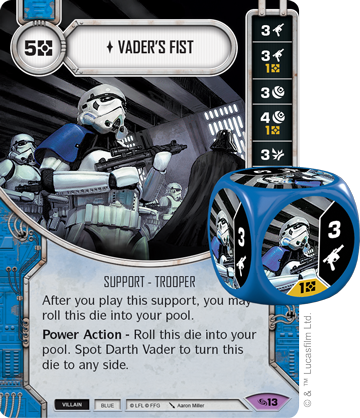 Vader’s Fist is the kind of card worth playing to though, whether by holding it in your hand or saving resources to play it. 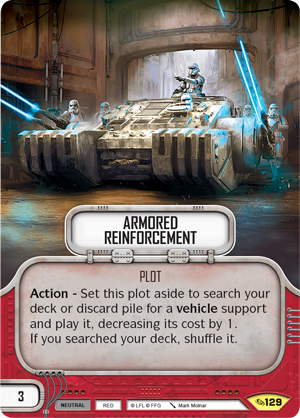 While a card like Vader’s Fist alters how you play the game, a plot like Armored Reinforcement (Across the Galaxy, 129) can let you build a completely different kind of draft deck. 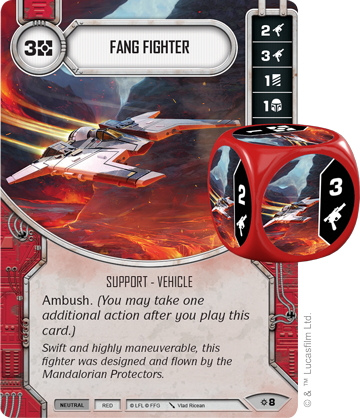 The Fang Fighter from Rivals is the kind of card that can win games as well, so being able to play it with Armored Reinforcements on your first turn every game, without using a card from your hand, is wild. Given that mods are also such a critical part of this set, guaranteeing you have a vehicle in play makes their value go way up! 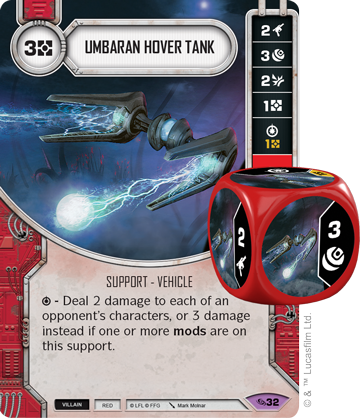 T he only thing that can make Armored Reinforcements even crazier while drafting Across the Galaxy is the Umbaran Hover Tank. Cards that can deal damage to multiple characters are few and far between, so being able to play this monster of a card on the first turn is even more insane than playing the Fang Fighter. It is going to take a similarly powerful start from your opponent to keep up with a deck with both of these cards. 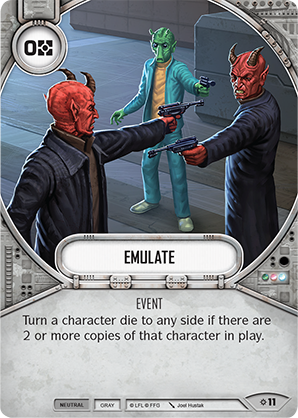 Finally, we have a more subtle card, Deja Vu (Across the Galaxy, 47). 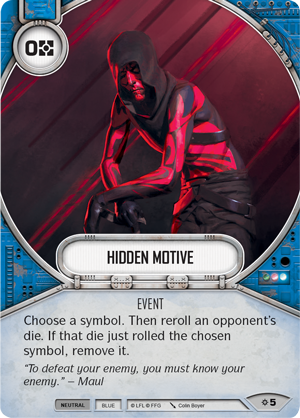 It only takes one time of playing two copies of cards like Hidden Motive (Rivals, 5), Emulate (Rivals, 11), or Imposing Presence (potentially to remove four dice!) to recognize how wild this card is. This is the kind of card I draft every time, even if I’m decidedly not playing Yellow. It’s just too good to let anyone else play! I've enjoyed drafting Across the Galaxy even more than the previous two sets, which is a tough accomplishment to reach! The varying restrictions placed on cards creates even more interesting (and difficult) decision points during draft and play than I experienced with previous sets. If you haven’t been able to draft Across the Galaxy yet, I highly encourage you to find a draft happening near you! I think you will be surprised at how differently you start valuing cards and actions in the game, even in constructed play.